I have a fascinating episode for you today. This week, Andrew Foxwell sat down with Jason Moser, a senior analyst for the Motley Fool investment research team. You might be wondering why we are interviewing someone who helps people pick stocks for a living. It turns out, Jason’s whole job at the Motley Fool is to research and analyze companies in the ecommerce sector and learn how they are innovating. This is a big picture episode and they talk about a whole bunch of things. Andrew and Jason get into talking about Wayfair and Amazon. They also talk about the state of ecommerce, Shopify, Facebook, Instagram, and a bunch of other things. I think you’ll really like this episode and I look forward to hearing your feedback on it. Enjoy! 6:05 How Ecommerce brands are innovating the marketplace. 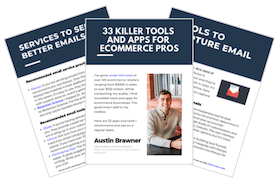 9:00 The two trends you should be exploring if you’re a growing ecommerce brand. 11:27 How creating your own version of Amazon’s “Prime Day” can generate revenues greater than Black Friday. 13:52 What Shopify is doing to help their clients grow their brands. 17:20 The one thing Dollar Shave Club has done to grow their business and how you can use it to grow yours too. 22:26 What your customers are really looking for (Hint: it’s not a discount). 30:00 The future of ad products on social networks and their perceived value for advertisers. 38:56 The one tip you should always follow if you plan to invest in the market. This episode is brought to you by Klaviyo. 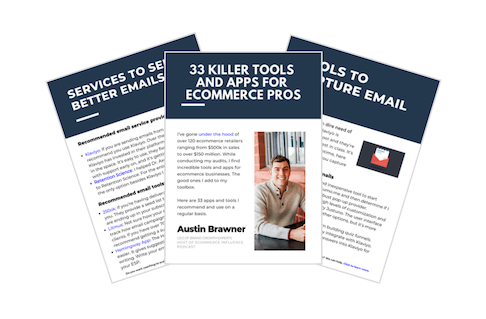 If you’re running an ecommerce business and sending emails to your customers, you should be using Klaviyo. It will help you find out who your best customers are and target them one-to-one to make more money. I’ve been using Klaviyo since they were just two employees. Now they have a team of 150 and are rolling out new features almost weekly. If you aren’t already a customer, head over to www.ecommerceinfluence.com/klaviyo and you’ll get a free trial + priority on-boarding. Andrew Foxwell: Hey, everybody, welcome to another episode of the e-commerce influence. My name is Andrew Foxwell, one of your hosts here, and I'm glad to be with you. Thanks for listening today. We have an awesome episode here with Jason Moser, who is a senior analyst for the Motley Fool investment research part of Motley Fool. If you've ever heard of the Motley Fool, they're an investment advisory company, and they have a whole bunch of different parts of their business. What Jason does, and how I got to know him, that is I feel like I've known him. Just met him actually when we recorded the podcast, but I get to know him on the podcast of the Motley Fool Money Podcast. That one is every Friday. It comes out and they analyze companies and stocks, and give you some stock pick ideas and give you ideas of what they're looking for to add to their portfolio. I don't have a lot of money in the market, by any means, but I'm interested in companies, as I think a lot of you are. That's Jason's whole job at the Motley Fool is to analyze and research companies in the e-commerce sector and a lot of other sectors, and what they're doing and innovating around. We talk today about a whole bunch of things. We get into talking about Wayfair, Amazon. We talk about e-commerce, Shopify, Facebook, Instagram, things like that. I think you'll really like this episode and I look forward to hearing your feedback on it. If you ever have thoughts on things, you can always email me at andrew@foxwelldigital.com and we'll look forward to this episode. Without further ado, let me welcome Jason to the show. Jason Moser: Hey, thanks for having me. Andrew Foxwell: Oh, man, it's an absolute pleasure. As I said, long-time listener, first-time caller here of the Motley Fool, which you're a celebrity host I would say, or celebrity guest. Chris Hill is the host, but glad to have you. If people don't know about the Motley Fool, can you tell them about what you do there and how you got into all this? Jason Moser: Sure, I mean, my father taught me about investing when I was a young kid, 12, 13 years old. We would talk about it sometimes on the way to school. That just piqued my interest and knowing that my money could actually work for me and from there, I mean, I majored in economics in college, always had an interest in business and economics and how all that stuff works together, and got into investing and some mutual funds and whatnot shortly out of college. Then from there, I mean, I discovered the Motley Fool while we were at an overseas post for my wife's job, and fast forward today, I was able to find that they were hiring for the analyst development position there back in 2010. I just took a shot and got lucky, I guess, and got my foot in the door and the interview went well enough to where they hired me, so I've been with the Fool for a bit more than eight years now. I am a research analyst, a stock analyst for the investment research that we do. We have a number of different wings of the business. I'm sure a lot of people are probably familiar with the fool.com side, which is the website that most people see on a public-facing front every day. We also have investment services that our members subscribe to, and that's what I help with. Then we also have an asset management and wealth management wing of the business that helps investors who are not looking so much to do it all on their own, but looking more for us to do it for them, so a number of different things we do, but ultimately our mission is to help the world invest better, and that's what guides our everyday work. Andrew Foxwell: Awesome, awesome, yeah. It's something that as I said, I've listened for many years. I think I've been a weekly listener now for, man, five years probably, so it's really cool to have you on the show. One of the things that I think is really unique for the audience to know that's listening is, a lot of what you do is analyzing companies. In today's market you're analyzing particularly a lot of e-commerce companies and finding out what they do. Obviously there's huge players like Amazon, et cetera, but what do you see e-commerce companies doing now that they weren't doing and have never really done before? What are some of the major innovations that you see people doing that's new? Jason Moser: Yeah, I mean, that's the fun of the job really, for me, is just being able to study all this stuff and then being able to communicate it. I mean, I really thank you for listening and I appreciate you having me on. It's flattering, to say the least. E-commerce has come a long way in a short amount of time. I think a lot of people, when they hear e-commerce, they immediately just think of Amazon, and that's fair given the market share that they own, but I do feel like we're identifying another swath of businesses out there that are really functioning quite well in an "Amazon world." These are businesses that don't really carry much of any inventory on their balance sheet. Rather they built these networks that just are connecting buyers and sellers all over the country and really facilitating those transactions. When I was growing up, I mean, if I wanted to go furniture shopping, I was more or less limited to the stores that were in Charleston, South Carolina where I grew up. Today I can go to Wayfair, and they can connect me with a furniture store in Sacramento, California or Madison, Wisconsin, or wherever it may be. I think the successful e- commerce companies today are really doing a great job of just building up these really strong networks and that's where we're finding a lot of this value from the investing perspective is, the value's in the network. It's no accident that Etsy's stock and Wayfair's stock have continued to do well, because I think they've just built up very valuable and strong networks. Andrew Foxwell: Yeah, the network, I think, is really huge. That's something e-commerce business owners, they'll have sometimes in early stage they'll say, "All right, I'm going to stand up my own website for whatever it is, andrewsproducts.com and sometimes they'll put them on an Etsy or something like that if I'm a creator. A lot of the people that listen to the podcast, we have had increasing number of people listening, 14,000 listeners now, which is awesome, and I guess based on the continued research, what are things that you suggest these small e-commerce business owners that have six and seven-figure ... e-commerce business owners do that are going to help them grow their businesses? What are two trends? I mean, do you think that some of it's things like AI? Do you think that continuing to invest in brand and how you pitch yourself so that you can have higher margins is a big part of it? I mean, what are things that you think these e-commerce business owners, based on what you said previously, too, should be focusing on? Jason Moser: Well, I mean definitely mobile, I think is something that everybody should be focused on. That is not something I think that's really going away any time soon. I think when we look at consumer behavior and the things that are dictating what we're doing as consumers, mobile is the driving force really behind that all. Not so many people are looking to get stuff done, perhaps, sitting at a desktop computer or a laptop computer these days. If you can reach out to customers on a mobile front, that is going to give you a lot more opportunities to reach them when they want to be reached and to pitch them whatever you're trying to sell them. I think also, if we're talking about things that companies can do, I think for me, when I try to think about what these e-commerce businesses, what drives long-term success for these businesses, it's keeping the customers that they get. I mean, Wayfair I think is a great example of a business model. When we look at Wayfair's strategy, and I've been covering Wayfair ever since they went public and so it's an easy example for me to pick out, they have a really interesting business model, it's super capital light. The deal is, they need to acquire these customers and then they just need to keep these customers coming back. Once they get this circle of just customers that keep on coming back, they'll be able to pull back on that spending, those acquisition costs. A lot of it will be the combination of pulling back on those acquisition costs and then being able to sell those returning customers more and more goods. That's what's going to bring these guys to profitability sooner rather than later. I think that as long as companies can do whatever it takes to keep those customers coming back, and I think there are a number of different levers you can pull there, whether that is free shipping, whether that is having an attractive mobile presence that keeps them coming back, whether it's a loyalty program. I mean, certainly Amazon Prime is the example out there, but it doesn't really mean that any e-commerce business out there can't do that. I mean, they can develop any kind of a loyalty program they want. Then you see something like, because of the timing here, we know that Amazon just had Prime Day, there's no reason that any e-commerce company out there can't copy what Amazon has done and do their own version of a Prime Day. Copying is okay in the business world. We see it all the time, particularly in tech. Facebook copying Snapchat. I think that's something we just see constantly here and this back and forth, it happens, it's okay. It's all about delighting your customers and figuring out what you can do to keep them coming back for more. Andrew Foxwell: Yeah, there's one e-commerce retailer I'm thinking of that, in the month of June, in late June it was National Sunglasses Day, and I think they actually beat their Black Friday/Cyber Monday sales numbers on essentially what is a copy of Prime Day, as you're discussing, right, of finding that particular day, which I think is interesting. I think another thing that's worth pointing out and re-emphasizing that you said is discussion around lifetime value and really pushing that for the customer and making that last longer. Going back, and we've talked on this program about using tools from Facebook like Facebook Analytics and others that are tools that can help you look at the lifetime value of your customer over time and how you are growing it. That's something that not a lot of advertisers have set up, which is a loyalty campaign targeting at previous purchasers, targeting even those people that are on your email list, because why not? They're already on your email list. You might as well talk to them on Facebook or Instagram as well. Then I think the third point here I want to make, or further point to emphasize for you, is on that acquisition cost, as that does make it cheaper over time. I think a lot about Blue Apron, honestly, who has had a major problem with acquisition costs and keeping that low. Just take a little bit of a turn to talk a little bit about platforms too, because I know you're very familiar with Shopify and talk a lot about Facebook and Instagram, a lot of the people clearly that listen to this podcast, majority of them, I would say 95% plus, have their stores and really their livelihood built on Shopify. What do you think Shopify has on the road map looking forward in terms of the way that they want to continue to serve their merchants and their store owners? Jason Moser: Yeah, Shopify is a super interesting business to follow because of what they've been able to do in such a quick period of time, in rolling out the capability of building an e-commerce business for virtually anyone out there. Shopify is also a recommendation in a few services of ours at the Motley Fool. It's done very well for our members, so we certainly do like that business there. I think it's interesting to watch the dynamics between something like Shopify and then also something like Weebly. I know Weebly is not quite the same thing, but Weebly recently was acquired by Square, and Square acquired Weebly in order to make it more of a Shopify-like asset. I think they spotted the convenience factor there, the ability for someone to go in and piece together their own e-commerce presence there in quick fashion. Shopify really, I think, shows the benefit of being really the first mover in the space to get out there and do everything they could to gain traction and grow that customer base as quickly as possible. For me, I mean, I think Shopify, we're going to continue to see them doing the things that they're doing, but I also look at companies like PayPal and Square. PayPal just acquired a company called iZettle, Square just a company, Weebly. I mean, these are all payments companies that are trying to reel more of that e-commerce capability into their business models. I suspect we're going to see PayPal and Square become a bigger part of this race as time goes on, but there's no question that they're looking at Shopify as really a company that has set a lot of the trend here in the space early on. Andrew Foxwell: Yeah, it's interesting, I was looking at some of the new experimental features that Shopify has coming out, one of them that particularly is really attractive to me. Facebook has announced they're going to put this into beta during the holidays, which will complicate consultants' lives like mine, which is totally fine, but hopefully make people more money, which is, you'll be able to, via AR, try on products or maybe not try on, but put things onto a shelf. Anybody that has a product uploaded that has imagery or whatever, be able to take that into AR and put that on your shelf and see what it looks like, or put it on your wall or try it on, which to me is insane. There's no way an individual company would be able to do that, right, so Shopify is the engine behind that, that makes it so much easier. I think the only threat that Shopify has is particularly being a little bit over-weighted on some of the apps that they allow on their platform. You talked about that, that mobile load time. I know that you've talked about the Dollar Shave Club before and what that looked like. I think some people on this podcast, our listeners, are going through an acquisition or want to think about acquisition, right, and that's a part of it for them. What do you think, particularly a company like Dollar Shave Club or others that are e-commerce brands that are these e-commerce brands that are, let's say, darlings that people are like, "Wow, they've grown so fast. It's really cool." What do you think they've done that other, smaller companies can take cues from? Jason Moser: Yeah, I mean, I look at Dollar Shave Club and I also look at Harry's as another example. I mean, I'll use both of them but I'll preface this by saying, I actually use Harry's and the main reason is because they're an advertising partner of ours for Motley Fool Money and Market Foolery as well. I was introduced to Harry's via our shows and the offer that they advertised on our show. To me, I think that Dollar Shave Club did the same thing and I think it was not surprising to me to see Dollar Shave Club acquired so quickly. It is surprising to me to see that Harry's has not been acquired yet. Perhaps that's by their own choice, but I think that when you look at what they've done so well, I mean, Dollar Shave Club keyed in on value right there in the name and the brand, right? I mean, immediately, when you're looking and you see Dollar Shave Club, and you're thinking, "Oh, well I mean, that's not something, it's not $100 Dollar Shave Club, right? It's Dollar Shave Club." Then they also advertise to their core customer a very simple offering, right? It's something that we guys have to do every day, or if we're lazy we do it every other day, but you got to shave your face and it becomes a hassle after a while. They keyed in on something that, I think is a phenomenon that we've seen more and more here as e-commerce continues to grow, is we have the opportunity now as consumers to value our time so much differently than we did probably 20 years ago. I mean, 20 years ago, if you needed something you had to go out to the store to go get it and that includes shaving cream and razors. What e-commerce has done is given us an opportunity as consumers to value our time much differently now. We have choices, more choices than we had before. Dollar Shave Club, I think very astutely, recognized this early on, provided a very simple yet valuable offering for a certain demographic, to say "Hey, there's no reason for you to have to worry about doing this anymore. We will, for a very fair price, set this up for you so you never have to worry about it again," and some days you'll just come home and that stuff just magically appears on your doorstep as if from nowhere. I think that given the market that they pursued, understanding that market really will never go away. The only thing that disrupts guys shaving is if you have laser facial hair removal, and I don't think many guys want to actually do that. I think between a smart brand communicating a very simple proposition and focusing on doing something really well, they just recognized this early on in the stage along with recognizing the fact that we have the opportunity to value our time much differently than we did 20 years ago. They really hit a home run there. Andrew Foxwell: Yeah, I think you're totally right on that, simplicity of the offer absolutely is something that they did and the simplicity of the message. How many times have you tried to go to an e-commerce store and you see something, and you really like it? Let's just take somebody that I know you like to, not bash but talk about their faults potentially, Bed Bath & Beyond. Every Bed Bath & Beyond has a 70-character discount code. It's like, this is too complicated. I don't even care. This is for a towel set. It's one of those things where I think in the practicality of things, a lot of e-commerce advertisers ask me, "Hey, should I have different discount codes in a different part of the sales funnel?" Well, sure, you can absolutely do that, but that's going to be complicated and people are going to be like, "Wait, I think I lost the discount code," and then you're going to have more customer service inquiries, right? You're taking from one thing and adding to another. I feel like the simplicity of Dollar Shave Club is perfect and it really hits that brand home, which I think is absolutely right. Jason Moser: Yeah, I think as long as you can reduce the amount of friction in the transaction. You're spot on about Bed Bath & Beyond. The interesting thing about Bed Bath & Beyond and it's nothing personal, right? It's just as an analyst, we have to make calls on businesses [crosstalk 00:21:59] I don't have anything personal against Bed Bath & Beyond, I just wouldn't own the stock. I think that's just because of what e-commerce forces are doing today and Bed Bath & Beyond, I do applaud them for this, but they actually have a loyalty program. I think it's technically still in beta, but essentially it's their version of a Prime. I believe it's something like $20 a year. Now, whether that ends up working out for them or not, I don't know, but if it can help keep them from having to mail off those coupons every day, then I think that at least puts them going in the right direction, right? It relieves them of some of that friction that the consumer's going to witness in trying to use their product. The neat thing about what e-commerce has done today, is because it gives us the opportunity to value our time differently, a lot of times consumers aren't necessarily looking for the lowest cost provider. They're looking for a brand that they trust, that they can rely on, that they know is going to give them good service. Price isn't always the determining factor there. I think it's worth remembering that and working on creating a seamless, frictionless, pleasant customer experience from start to finish, oftentimes will be a far greater opportunity to build a loyal customer as opposed to just being the low price provider. Andrew Foxwell: Yeah, no, I absolutely agree. I think back to the Bed Bath & Beyond thing, I agree. One thing that's important to point out here is of course the Motley Fool is known for long-term investing. That's the key, I think, part of it of why you're not recommending the stock, which is totally fine. I think that the loyalty program, it's interesting, we've seen parallels in other colleagues that we have that have started VIP customer groups. Their best customer is people that are in there, they're a Facebook group in many cases, and they have purchased several times. We have instances now of one I can think of and it's Constantly Varied Gear, the brand, and they're a workout brand. Mark, the CEO has created a group of advocates where he asks them their opinion on new products that he's going to develop, he asks people what they're doing, he gives them new deals right off the bat, which I think is a great way to think about the loyalty program concept. One thing I'm curious about of your opinion in e-commerce, too, that I haven't heard a lot of people talk about, but I think is enormously important, is the power of reviews. The power of reviews as it relates to, on people's website, and things like that, that's become a really big part of marketing as well. How do you see that changing? Do you think it's going to become more integrated in marketing messages or do you feel like we're going to see more marketing that's pushed where people are saying, "Hey, this is who I am. I bought this product and I love it." I'm just curious on your take there, because I feel like it's an afterthought for some people, but if you're going to buy something and pay that higher price, you want to see the review and if the review is good, then it validates it. It doesn't matter whether it's $20 or $40 in a lot of cases, I think. Jason Moser: Yeah, I actually totally agree. I think a higher-priced product, perhaps that creates a little more urgency in the customer's mind to check out a few of the reviews, but I think the reviews become such an asset for the companies that solicit them and present them fairly, so that you see both sides of the argument. I think that successful businesses, again I can look at Wayfair as one and Amazon as another, that they're just businesses that I've had to use here over the recent past where I've relied on those reviews. Another business that, really this business was built on reviews and it is an e-commerce company to a degree, I guess, is TripAdvisor. TripAdvisor, it's an interesting business in that they tried to make this pivot a couple of years back to becoming more of an OTA, an online travel agency, like a Priceline, Booking.com, and that didn't work out so well for them. It wasn't the greatest strategy move in the world, but what TripAdvisor has at the end of the day is this just huge plethora of reviews for everything from hotels to restaurants to places to see and places to go. That certainly affects where people decide to travel and where they decide to stay, and then where they decide to go do what they're going to do where they stay. For me, any company that works on soliciting those reviews and presenting those reviews in a fair and a credible fashion ... You got to offer up the bad with the good, right? Give people at least both sides of the story there, because nothing out there is perfect, but reviews to me are an easy little point of leverage there that any of these businesses could use as a tremendous asset that can last a very long time. Andrew Foxwell: Yeah, I completely agree. It's interesting. I'm an owner of TripAdvisor stock. I like the company. I think you're totally right. The issue I have with them is getting back to your original point on mobile experience, is TripAdvisor to me is so user-experience heavy. There's too many things to click on, it's too cumbersome. It's not a clean product, so I really feel that if they rolled out a clean version of that product that was less heavy from a UX perspective, that it could be even better, because the mobile experience on it crashes for me, it's not reliable, it's hard to understand it. The search functions aren't super intuitive. Those are my beefs in case you have a direct line to give feedback on that. Jason Moser: I hope, I mean, as a shareholder I've had TripAdvisor shares for, I think about three years now, and my position is, I think somewhere in the neighborhood of 10 or 15% down still, which is frustrating because of the value that I get out of it as a user. A quick story here, but our family, my wife and our two girls, we went to the Bahamas in March and I mean, relied so heavily on TripAdvisor to find places to go do things. I think you hit in on something there, is they have not nailed their mobile experience yet. It's helpful but it could be better. It sounds like they're working on that, but again, until they actually develop that reputation for being a seamless, quick, slick mobile app, they're going to be held back a little bit. I think that really goes back to one of those points we were talking about earlier, is the importance of having that mobile presence. It's simply not a trend that's going away. Furthermore, if you don't have a slick mobile presence, well there are a lot of companies out there, probably playing in that same sandbox that do have a slick mobile experience, and that's going to put you a little bit behind the eight ball. Andrew Foxwell: Yeah, I completely agree. Talking about getting back to one of our original conversations on Facebook and Instagram, talking more about platforms, Facebook, Instagram, Google are, I would say the main Google products, YouTube, others, are the main drivers for most of the e-commerce companies we're talking about. Most of them started with the Facebook ads and have now, due to ad load moved a lot onto Instagram and have that be the main driver of revenue for them, and then some search engine marketing, AdWords type things. Some use Snapchat and Twitter, but I'm curious to hear your perspective about, what has Facebook done with Instagram and Facebook itself from a feature set perspective with ad products that you think Snapchat and Twitter have not done? What's your take on where you think they might be headed for marketers? Jason Moser: Sure. I think a lot of this gets back to really just the nature of the platforms and what people use them for. I mean, I'll go ahead and preface this by saying I'm not a Facebook user. I actually, recently just deleted my account completely because I just never used it and I felt no reason to maintain it, especially with all this data stuff that was going on. Believe it or not, I'm not an Instagram user either but my wife is, so I do get some perspective from her. It's interesting to see how she's noting more of her time is going away from Facebook and to Instagram. I think that speaks to really how shrewd Facebook was early on to make that acquisition. That was a tremendous acquisition. It gives Facebook a little leeway and a little time to try to maybe get it right. I think that Facebook is becoming a little bit more cluttered, a little bit more clunky. You mentioned ad load and I think people start getting a little bit fed up when they see a platform that's just riddled with ads and not really what they want to see. Fortunately for Facebook, a lot of those customers, they can just go over to Instagram and they're doing the same thing over there, but I think the bottom line is that the purpose the platform serves, Facebook and Instagram are places where people go to see what's going on. It's not time-sensitive. You probably hear some people use the bulletin board example. You just pin something up there and then anytime you want to go check it out, you can go check it out. They built these huge networks based on that basic idea. It's just a place to go hang out and see your friends and see what's going on, whenever you want to do it. That's very friendly from an advertising perspective whereas something like Twitter, which they're obviously turning some things around in regard to the product and becoming a more robust ad business now, but the nature of the platform, it's more difficult to advertise on that platform, at least in the timeline sense. It's very fast and free-flowing, so unless you're looking for brand advertising it's very difficult to get a direct response thing going on Twitter, because things are gone in the snap of a finger. Now, that pivot to video that they're making should help counter that a little bit by getting eyeballs on the platform for longer periods of time. Snapchat, I think, faces an entirely different set of problems, again because of what the platform does, what it's used for and its ephemeral nature, but also the demographic that pursues it. I mean, it's not to say that younger people aren't people too, but I think generally they're going to be a little bit hamstrung in that the platform is used for one-on-one communication more than anything else, and it fails to realize that more powerful network effect that you'll see in a Facebook or an Instagram, or even potentially a Twitter. I mean, you can certainly see those are companies that are garnering more ads. I mean, Google, they've just done so many tremendous things in searches, just one of those things that's never going to go away and they've capitalized on that for so long. I think it just really all boils down to the nature of what the platform's used for in the beginning. Andrew Foxwell: Yeah, I know. I completely agree and having expectations that way, too, is always important for advertisers, searches is demand capture, and Facebook and Instagram are really demand generation. You have to take people all the way through the life cycle of not knowing they need your product to being like, "Oh, yeah, I do need a razor" or whatever else. Switching gears, just as a final question here before I let you go, a lot of the people listening, as we've said, small business owners, e-commerce business owners, they are managing their own cash flow, et cetera. We want to start investing. How do you recommend even people get started in investing generally, just from a super basic perspective? Is it taking certain percentage of your income and setting it aside, and then once you're there, how do you know what to buy? I mean, because I think people want to take control but they aren't totally sure, so I'm curious of your take on that. Jason Moser: Yeah, it's a big, scary world out there from the investing perspective and I think there is a lot of trepidation based on the behavior of Wall Street throughout time. I think people are genuinely skeptical, feel like maybe the market is too big of a risk. I understand that perspective. I think the bigger risk, honestly, is not investing though, and I think that we have to look at today's environment and say, well, where interest rates are today, where they're going to be 10 years from now, 20 years from now, you cannot look at a savings account as any type of a meaningful wealth creator. It's just not going to happen. We always have this saying, "Before you invest, you have to be able to save. You can't invest something you don't have." Small business owners, I certainly recognize the challenges there, because as you mentioned there, they're managing that cash flow very closely. They have to pay attention to every penny that's going in and out. For small businesses, any small business owner that has the opportunity to set aside anything, anything at all from the start, I think that you just take that first step and you do that on a regular basis. You have essentially whatever you have to do to mirror an employee like me, where at work I just have a certain percentage of my pay check is taken out every two weeks and it goes into a retirement account. Whatever a small business owner can do in that regard, they can put that away in an IRA or something similar. You and I were talking about some of the vehicles you're using as well. I think the key is in getting started, to make sure that you are diversified in such a way that it takes the fear out of investing. What I mean by that is, don't focus on buying stock in a company, rather go ahead and just buy shares of an S&P index fund. There are so many low-cost options out there now for index funds and exchange-traded funds, where investors can buy shares in these actual funds that have a little bit of ownership in all 500 companies that are in the S&P index, and it's immediate diversity. That diversity can help you sleep better at night, knowing that you're not putting all of your eggs in one basket, so to speak. If you look at the market over time, five years, 10 years, 15, 20 years, it goes up. Now, it's not a straight line up. There are periods of tumult, but I will say that the way to counter that is to invest regularly, figure out a way that you can just do it regularly every month, and if you can dollar cost average your money into an S&P index fund every month at a regular interval, over time that will yield, I think, some very impressive results. Like I said, it's not always a straight line up. There will be periods where you see this up and down and you'll even run into another financial crisis, but truthfully I look back at the financial crisis as one of the biggest opportunities in my life from an investing perspective, because I learned so much about the market and about what I can tolerate, and about how I needed to adjust my investing strategy to really let me sleep at night. You look at those as opportunities to learn and they will make you better. I think as long as you can build good exposure to a diverse holding, and the S&P index one is a great way to do that, in time that will also afford you the opportunity to then buy stock in individual companies if you decide you want to take that next step. Andrew Foxwell: Yeah, I completely agree, building that base of the index funds, as you've said, and then getting into companies that you know. That's really how my brother-in-law, who's the one that inspired me to get into this, he said, "Buy what you know. Focus on what you understand," and that's why I primarily own shares of companies that I believe in and know and get, and see a long-term vision as well, see a long-term growth proposition there. I think that's a big part of it. Jason Moser: I think for investors to remember also is that when you're investing in stocks, it's not about getting it right every time. None of us gets it right every time. It just doesn't happen. I mean, if we invest in 10 separate companies, then we're doing it really well if it works out six times out of 10. I do think that the longer you make your timeline, the better off your chances of success are. I think the longer you can hang onto those stocks, the better off you'll be, and that's why we approach investing the way we do at Motley Fool. It's very Warren Buffet-like, very Peter Lynch-like. Yeah, I think you make a great point there. Invest in things that you understand first and foremost. If you can't tell me how that company makes money, you should not be giving them yours. Andrew Foxwell: Yeah, it's a good point. For people that want to connect and go a little bit further, do you suggest they get started with the Motley Fool Money Podcast that's released every Friday? What's the best way for them to get invested in your investment advice? Jason Moser: Well, I think definitely we always welcome new listeners. [inaudible 00:39:33] a Motley Fool Money that goes out every Friday in podcast form. We syndicate that with radio stations across the country. That's a once-a-week show. We also have a daily podcast called Market Foolery, and that plays Monday through Thursday. It's similar to Motley Fool Money, a bit more of a daily focus, but again the topics are all the same. It's about these companies that we're following from the investor's perspective. Then you can certainly always check out fool.com for what's going on at the Motley Fool in all of our podcasts, because we do have more. Then you can always follow me on Twitter at TMFJMo and I am always thrilled to answer any questions and help in any way that I can. That's where, I think, you'll probably find me most of the time. Andrew Foxwell: Awesome, awesome. Well, thank you so much for joining us and sharing your knowledge, Jason. We really appreciate it. It was great to have you on. Jason Moser: It was my pleasure, Andrew. Thanks for having me.